This package provides functionality for analyzing biological diversity. It implements metrics of alpha and beta diversity, and provides two “driver functions” that are intended to be the primary interface for computing alpha and beta diversity with scikit-bio. Functions are additionally provided that support discovery of the available diversity metrics. This document provides a high-level discussion of how to work with the skbio.diversity module, and should be the first document you read before working with the module. The driver functions, skbio.diversity.alpha_diversity and skbio.diversity.beta_diversity, are designed to compute alpha diversity for one or more samples, or beta diversity for one or more pairs of samples. The diversity driver functions accept a matrix containing vectors of frequencies of OTUs within each sample. We use the term “OTU” here very loosely, as these can in practice represent diverse feature types including bacterial species, genes, and metabolites. The term “sample” is also loosely defined for these purposes. These are intended to represent a single unit of sampling, and as such what a single sample represents can vary widely. For example, in a microbiome survey, these could represent all 16S rRNA gene sequences from a single oral swab. In a comparative genomics study on the other hand, a sample could represent an individual organism’s genome. Each frequency in a given vector represents the number of individuals observed for a particular OTU. We will refer to the frequencies associated with a single sample as a counts vector or counts throughout the documentation. Counts vectors are array_like : anything that can be converted into a 1-D numpy array is acceptable input. For example, you can provide a numpy array or a native Python list and the results will be identical. As mentioned above, the driver functions accept one or more of these vectors (representing one or more samples) in a matrix which is also array_like . Each row in the matrix represents a single sample’s count vector, so that rows represent samples and columns represent OTUs. Some diversity metrics incorporate relationships between the OTUs in their computation through reference to a phylogenetic tree. These metrics additionally take a skbio.TreeNode object and a list of OTU identifiers mapping the values in the counts vector to tips in the tree. The driver functions are optimized so that computing a diversity metric more than one time (i.e., for more than one sample for alpha diversity metrics, or more than one pair of samples for beta diversity metrics) is often much faster than repeated calls to the metric. For this reason, the driver functions take matrices of counts vectors rather than a single counts vector for alpha diversity metrics or two counts vectors for beta diversity metrics. The alpha_diversity driver function will thus compute alpha diversity for all counts vectors in the matrix, and the beta_diversity driver function will compute beta diversity for all pairs of counts vectors in the matrix. The driver functions perform validation of input by default. Validation can be slow so it is possible to disable this step by passing validate=False. This can be dangerous however. If invalid input is encountered when validation is disabled it can result in difficult-to-interpret error messages or incorrect results. We therefore recommend that users are careful to ensure that their input data is valid before disabling validation. The conditions that the driver functions validate follow. If disabling validation, users should be confident that these conditions are met. There are different ways that count vectors are represented in the ecological literature and in related software. 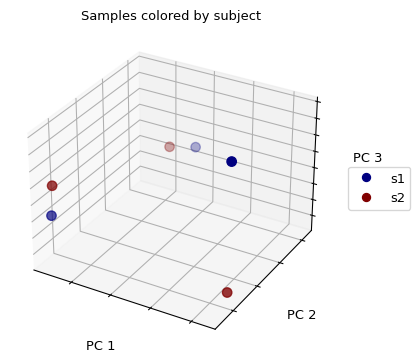 The diversity measures provided here always assume that the input contains abundance data: each count represents the number of individuals observed for a particular OTU in the sample. For example, if you have two OTUs, where three individuals were observed from the first OTU and only a single individual was observed from the second OTU, you could represent this data in the following forms (among others). Always use the first representation (a counts vector) with this module. The driver functions take a parameter, metric, that specifies which diversity metric should be applied. The value that you provide for metric can be either a string (e.g., "faith_pd") or a function (e.g., skbio.diversity.alpha.faith_pd). The metric should generally be passed as a string, as this often uses an optimized version of the metric. For example, passing metric="faith_pd" (a string) to alpha_diversity will be tens of times faster than passing metric=skbio.diversity.alpha.faith_pd (a function) when computing Faith’s PD on about 100 samples. Similarly, passing metric="unweighted_unifrac" (a string) will be hundreds of times faster than passing metric=skbio.diversity.beta.unweighted_unifrac (a function) when computing unweighted UniFrac on about 100 samples. The latter may be faster if computing only one alpha or beta diversity value, but in these cases the run times will likely be so small that the difference will be negligible. We therefore recommend that you always pass the metric as a string when possible. Passing a metric as a string will not be possible if the metric you’d like to run is not one that scikit-bio knows about. This might be the case, for example, if you’re applying a custom metric that you’ve developed. To discover the metric names that scikit-bio knows about as strings that can be passed as metric to alpha_diversity or beta_diversity, you can call get_alpha_diversity_metrices or get_beta_diversity_metrics, respectively. These functions return lists of alpha and beta diversity metrics that are implemented in scikit-bio. There may be additional metrics that can be passed as strings which won’t be listed here, such as those implemented in scipy.spatial.distance.pdist. Next we’ll compute Faith’s PD on the same samples. Since this is a phylogenetic diversity metric, we’ll first create a tree and an ordered list of OTU identifiers. Now we’ll compute Bray-Curtis distances, a beta diversity metric, between all pairs of samples. Notice that the data and ids parameters provided to beta_diversity are the same as those provided to alpha_diversity. Next, we’ll compute weighted UniFrac distances between all pairs of samples. Because weighted UniFrac is a phylogenetic beta diversity metric, we’ll need to pass the skbio.TreeNode and list of OTU ids that we created above. Again, these are the same values that were provided to alpha_diversity. Next we’ll do some work with these beta diversity distance matrices. First, we’ll determine if the UniFrac and Bray-Curtis distance matrices are significantly correlated by computing the Mantel correlation between them. Then we’ll determine if the p-value is significant based on an alpha of 0.05. Next, we’ll perform principal coordinates analysis (PCoA) on our weighted UniFrac distance matrix. PCoA plots are only really interesting in the context of sample metadata, so let’s define some before we visualize these results. We don’t see any clustering/grouping of samples. 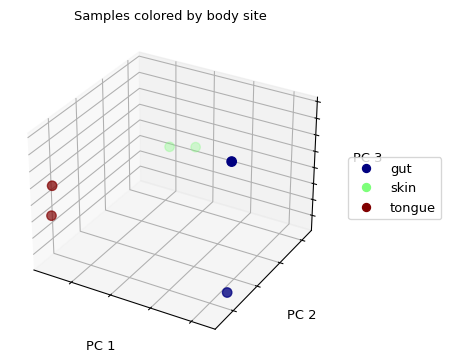 If we were to instead color the samples by the body site they were taken from, we see that the samples from the same body site (those that are colored the same) appear to be closer to one another in the 3-D space then they are to samples from other body sites. Ordination techniques, such as PCoA, are useful for exploratory analysis. The next step is to quantify the strength of the grouping/clustering that we see in ordination plots. There are many statistical methods available to accomplish this; many operate on distance matrices. Let’s use ANOSIM to quantify the strength of the clustering we see in the ordination plots above, using our weighted UniFrac distance matrix and sample metadata. The negative value of ANOSIM’s R statistic indicates anti-clustering and the p-value is insignificant at an alpha of 0.1. The R statistic indicates strong separation of samples based on body site. The p-value is significant at an alpha of 0.1. We can also explore the alpha diversity in the context of sample metadata. To do this, let’s add the Observed OTU and Faith PD data to our sample metadata. This is straight-forward beause alpha_diversity returns a Pandas Series object, and we’re representing our sample metadata in a Pandas DataFrame object. We can investigate these alpha diversity data in the context of our metadata categories. 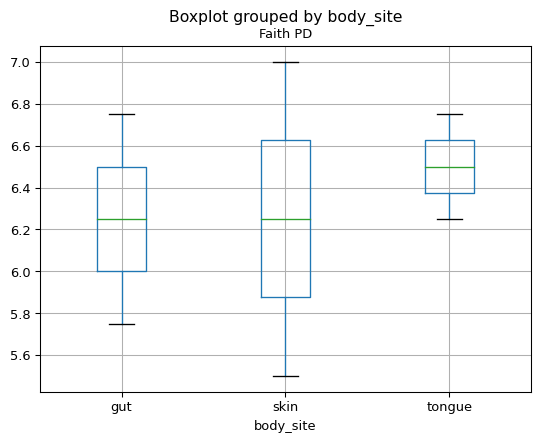 For example, we can generate boxplots showing Faith PD by body site. We can also compute Spearman correlations between all pairs of columns in this DataFrame. Since our alpha diversity metrics are the only two numeric columns (and thus the only columns for which Spearman correlation is relevant), this will give us a symmetric 2x2 correlation matrix.